John Calipari tweeted a picture of Mt. Rainier on Thursday evening and unless he’s taking a vacation to the Pacific Northwest it likely means he was heading to an in-home visit with Jaden McDaniels. It also appears Kentucky will meet with Keion Brooks this weekend, too. These are two names that were close to fan favorites in the spring or the beginning of summer, but haven’t been discussed with UK’s 2019 recruiting efforts over the last couple months. This seems like a somewhat bizarre development for Kentucky’s staff. UK has added Kahlil Whitney and Dontaie Allen last month and that seemed like it would end Kentucky’s chances with Brooks and McDaniels. And yes, McDaniels is more of a four than any of the other players, but he’s going to translate to a three at the college level and UK already has two wings committed in the class. Stranger things have happened in recruiting but I don’t see a scenario where McDaniels or Brooks end up in Lexington for college. There’s more of a mystery around McDaniels, and it’d be silly to tell UK’s staff they’re wasting time in a recruitment, but I can’t imagine UK can do enough to land either player. 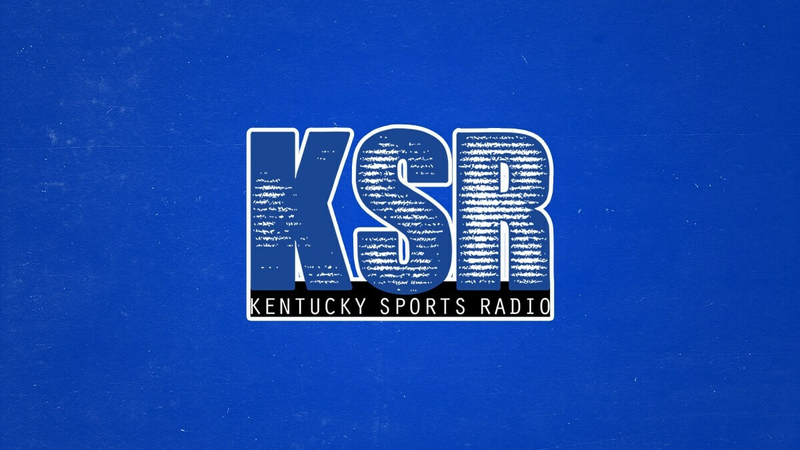 McDaniels claims to be wide open in his recruitment, and he did say that UK was his dream school (he later clarified that he currently doesn’t have a dream school and that he liked UK when he was a kid. Really wanted to drive that point home at Peach Jam that Kentucky was no longer his dream school), but Washington is in a good spot in his recruitment and surprisingly San Diego State is right there, too. His brother plays for the Aztecs. Kansas and Arizona are other blueblood programs that are in the hunt. As of today he doesn’t hold an offer from UK, but maybe that changed during the meeting. The biggest thing I’ll be looking for out of this in-home visit is if McDaniels schedules an official visit to Lexington. Obviously if McDaniels never visits Kentucky then that means he’s not going to Lexington, but if my opinion is correct that UK is behind, an official visit could change things. It doesn’t seem like McDaniels is rushing to make a decision anytime soon, so that could be good news for the Cats. In the summer when things started to quiet down with McDaniels I was told that UK was still talking to him “once or twice a week”. I’m starting to think that never really changed, but with McDaniels on the west coast, and UK landing two other wing targets, there wasn’t as significant as a buzz around McDaniels. UK has recruited other bigs harder than McDaniels, but it’s probable that Kentucky has been in contact all along, but did a solid job of keeping things underwraps. Or recruiting folks just missed it. I’m guilty of this because I haven’t mentioned McDaniels or Brooks in weeks. We all know how calculated John Calipari is, so it’s fair to ask why he tweeted the picture that shows him going to the Pacific Northwest? Was he throwing us media folks a bone? Did he want the nation to know that he still thinks he has a chance with McDaniels? I’m still trying to figure out why Calipari tweeted the picture, but maybe he just wanted to share a pretty picture of Mt. Rainier. Again, I don’t think the Cats have a chance with Keion Brooks (he seems like a heavy Hoosier lean), and I think it’s a longshot with McDaniels, too. But I also didn’t see UK visiting either for in-home visits and potentially bringing them in for official visits. This recruiting cycle is starting to remind me of 2015. UK had their top targets but slowly started to cast a wider net. It was a weird class that resulted in several head-scratching recruiting decisions. I don’t know if we’ll have as many head-scratching decisions, but the Cats are casting a wider net. Make of that what you will. My opinion is that UK still feels good about a few big targets in 2019, but is putting some pressure on some targets. The Cats would like one or two bigs signed in the fall. Let’s not get so pessimistic. If they don’t wind up at Kentucky it’s really not the end of the world. First, it’s extremely important that they have to want Kentucky. They just do. They have to want to go to the next level more than they care about breathing. And they to be all right being high profile. This is Kentucky, the land of Wildcat basketball. There’s a big horse race and we got bourbon. We also have amazing barbecue. But this is where we’re at—we show our players more love than any fan base out there and it’s a life long relationship. They don’t want that? They don’t bleed our blue. Seattle is awesome. Mt. Rainier is magnificent. Absolutely one of the most profoundly beautiful locations I’ve ever witnessed. Incredible. Never underestimate the power of Cal’s recruiting. He is the MASTER. I am starting to think Cal is getting desperate. I hope I am totally wrong and we get our recruits but I still think Wiseman to Memphis.